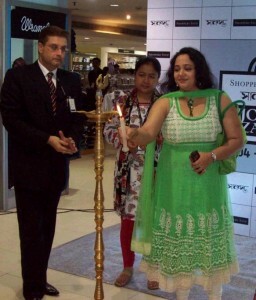 Shoppers Stop is the largest department store chain in India. The company also has a 51% stake in Hypercity, a hypermarket format. We’d like to review the performance in the past quarter and outlook going forward. Trends in July and August were similar to those seen in Q1. However, September has been better than expected. Hopeful that the festive season will see some traction. Should have visibility starting mid October. What we have noticed is due to the slowdown, breakeven for new stores has slipped from 18 months to 24 months. Performance of tier II stores has been a mixed bag. More than income levels, customer acceptance of premium products and brands seem to be the major difference between stores. Store openings remain a focus area in the Shoppers Stop format with 8 per year planned in FY14-15 as well. The drag on profitability from losses in new stores will continue in FY13 and a part of FY14. The management plans to invest 1 Bn every year. Debt will likely peak in end FY13 – 1HFY14 and decline after that. Overall gearing levels remain well within comfort range. Normalisation of margins to 8% only likely by FY15. Investments in Hypercity will be Rs0.4bn a year. Store opening plans have been cut back. 1 store planned this year, four more over the next two years. Some of the existing stores are too large (tier II). Need to be downsized. Process ongoing. Gross margin rising – being driven by rising apparel, more private label.